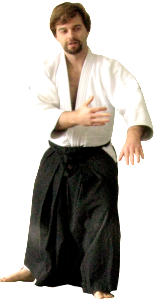 Sensei Kevin Kelleher, 5th Dan Black Belt, began training in martial arts at the age of 12 and started training in Aikido in 1991 at Kenshinkan dojo under Sensei Ken MacBeth at the age of 19. He began teaching the children’s program in 1993 and opened his own dojo in 1999. Kelleher sensei is now chief instructor and dojo-cho of Aikido of Escondido and a member of the Aikido Association of America’s Western Region Testing Committee. Sensei Lucy Kelleher, also a black belt in the art of Aikido, primarily teaches the children’s classes. “Sensei” means “teacher” or “instructor”. During classes, the instructor is addressed as Sensei.